Tens through Twelves take Choice Classes together that meet Mondays, Tuesdays and Thursdays for one hour. Flag Football (Woobens Celony) The Superbowl is over and the new season has yet to begin, so it’s time for the true football fans to show what they got! Campers will have the opportunity to learn the ins and outs of football (tackling not included), including teamwork, route running and even basic offensive and defensive schemes. Each class will even feature a full game of flag football. By the end of the class, we will be witnessing the next generation of football superstars! Experimental Dying Techniques (Matt Mahler) There are so many ways to change the color of fabric and paper. 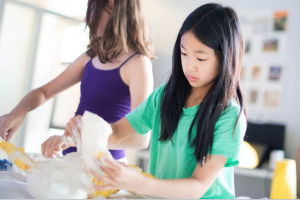 Campers will explore and experiment with tie-dye techniques, as well as indigo dye while making unique dyed clothes and prints. Campers will be guided through classic patterns as well as be encouraged to experiment with new methods as they figure out which kind of dying process they like the most. Jewelry Making (Morgan Wright) In this class we will explore a variety of techniques and materials for making jewelry and other wire-working projects. Campers will learn techniques for making earrings, bracelets, rings, and other jewelry; techniques which can also be used to make bookmarks, wire sculptures, pins, keychains, and more. If you like the sound of getting creative with wire, pliers, and beads, then this is the class for you. Daily Elective (TBA) Daily Elective is an hour-long workshop where Tens-Twelves and Specialty Camp campers choose from three rotating activity options. The activities are offered at our 40 Charlton Street campus, and change each day to include a Performing Arts, Visual Arts, and Sports/Games choice. Make ‘Em Laugh (Rachel Kaly) Do you love to make people laugh? Do you love performing but dread memorizing lines? Then this is the class for you! Campers will learn the basics of improv, a comedic performance style where everything is made up on the spot. We’ll play games that teach you to think on your feet, practice our acting chops with some exercises, and end the session with a final performance! Ball Games (Henry Rice) Ball games will provide the perfect place for kids to move their bodies and play hard! Campers will enjoy classic games such as kickball and Gaga as well as new fun games like Quidditch, Dr. Pin-Daddy and Slapball (think a mix between gaga and kickball, but with mats for bases). Kids will develop their skills in teamwork and coordination. Modern Masters (Matt Mahler) Be inspired by the most recognizable artists of the last 150 years in this creative choice class. We will look to artworks by recognizable artists including Picasso, Warhol, Frida Kahlo to become inspired and then create our own masterpieces using paint, oil pastel, collage, printmaking and even sculpture techniques. Create Your Own Restaurant (Calla Kennedy) In Create Your Own Restaurant, we learn what it takes to run our own restaurant! Through group activities, cooking projects, and dramatic play, campers will learn the skills needed to run a successful restaurant. Campers will work together to design a menu, learn how to set the table, take an order and serve our fellow campers at our end of class share grand opening. Make your reservations now!